NELTA Surkhet hosted second phase of 15th NELTA International Conference. Despite few weaknesses, the ceremony was taken to be a grand success. It gave good message not only to the participants, but also to the host and its centre. The conference took place from 24 to 25 February 2010. 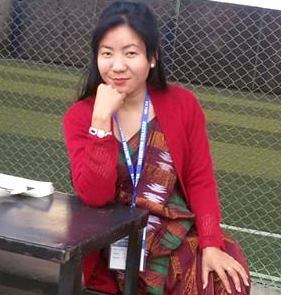 NELTA Surkhet labored hard with a sense of fortune to host the conference and a chance to show the branch’s ability. The branch certainly got the chance to be fortunate. But how much it became able to show its ability is in the judgment of the participants. On the following day after the NELTA International Conference in Kanthmandu, 21 Feb., Professor Dr. Jayraj Awasthi, NELTA Chair Gangaram Gautam, Dr. Numa Markee, the key note speaker of the conference and Kate Miller, a UK English language fellow, flew to Surkhet. They took pre-conference class on course designing to the teachers of degree level of different campuses. Many national and international participants arrived the venue the same day. The participants were delighted to see before them and hear the insightful presentations of Numa Markee, the key note speaker, of Kate Miller, and of their guru Prof. Dr. Jayraj Awasthi in the plenaries. And they also felt enlightened by getting innovative methods of ELT from the presentations in the concurrent sessions of the foreign delegates like Prof. Dr. Stefan Colibaba, Susna Kennedy, Kate Miller, Susan Deith, Dr. Boguslaw Marek, Gretchen Coppedge, Dr. Numa Markee, Kateerine Lea, Deniel Stead, Marilyn Eversloe, Beth Trudell, Khalid Mehomood Ch and of many other foreign and Nepalese presenters. There was a cultural show from Folk Songs Academy Surkhet after the closing ceremony, which made most of the audience including NELTA President Mr. Gautam dance. Ms. Kate Miller gave a three-day post-conference ToT to forty participants. All the participants were very happy to know the importance of learning English sounds in the journey of learning English. She found enormous hunger for learning in the participants. Miller had given a teacher training at Birendranagar two years ago, too. She found many of the participants of that time taking part at this time as well. However, she was surprised to find no any change i.e. professional development in them. However, despite our best efforts for good arrangement of the conference, we noticed so many weaknesses during the event. For example, we could not manage time, volunteers and reporters/rapporteurs; we could have managed some guest houses for some participants as the hotels were too expensive; there were some defects in multimedia and food managements; we all looked wild as we all had to do everything; the journal was not well-prepared and came few minutes late. And there were certainly many more. We would have been happy if we had been reminded of the weaknesses. NELTA President Mr. Gautam only said, “There were some weaknesses but the conference was far better than the one we first conducted in Kathmandu.” Senior vice-chair Mr. Laxman Gnawali said, “The Surkhet event proved that we can conduct NELTA international conference even outside the capital.” General secretary Mr. Hemant Dahal expressed his satisfaction for his coordination in making the quick decision to conduct the conference at Birendranagar. Ms. Kate Miller said, “NELTA should do something for the teachers of remote areas of Nepal. Government should support for this. They should make a five year plan.” All the foreigners thanked for the management and hostility. They praised the geographical features of the valley as well. However the conference, we are thankful to the NELTA Central Committee for its quick decision without any hesitation. As our Chair Mr. Uttam Gaulee knew that I was going to attend the central meeting after the event, he said, “Please convey my thanks to the centre for their all supports to Surkhet branch.” All the foreign delegates including Dr. Numa Markee and Neplese delegates including Prof. Dr. Tirth Khania, Prof. Dr. Jayraj Awasthi are also thankful as without their presence the event could never have been so worthy. All the trainees must be thanked as the event could not have been successful without their presence. Donors like District Development Committee Surkhet, Surkhet Campus Education, different public and private schools are also thankful as their help made the works easier for us. And credit goes also to Surkhet Intellectual Forum (SIF) for its help in coordination. We are sure that if Surkhet or another branch gets another chance of holding such a mega event in the future, it will not leave any stone unturned. Surkhet represented an explosion of enthusiasm, both from the very hard-working committee and from the grass roots teachers who are the ones on the front line daily doing a fantastically difficult job. My memories of Surkhet, the morning before the conference, a bare field and rain. A possible disaster. But no! As the day wore on, sun re-appeared, people and equipment arrived, a beautiful canopy, hundreds of chairs, pots and pans, flowers. Laughter and chatter. Maybe Uttam looked a little worried on occasions, but with the enormity of the job he had willingly undertaken, who wouldn’t look a little worried. People were happy to gather, to talk, to meet old acquaintances and make new friends. I loved the ‘on-the-hoof’ problem solving, how to make the large canopy technology friendly – it was rather too light for the slide show – to do this with everyone watching and patiently waiting took a lot of focus. The problem did get solved, and the next day alternative arrangements made. Yes, there were some grumbles, there always are at things like this, no-one can please everyone all the time. But to put together a two day conference in this remote area, with hundreds of hungry teachers, and flying in, and bussing in participants and fighting for limited hotel space, AND MAKING IT ALL WORK BRILLIANTLY, was a massive achievement for NELTA Surkhet, and this will always stand as a model for other branches who will understand the courage and tenacity needed to put on an event like this, but who know that it is possible and can happen for them too. During the conference and the TOT, (and from emails I have received since), I was overwhelmed by the many teachers who want to learn so many things. Not just individuals, but organisations, who are desperate to upgrade their knowledge of ELT and their practice in their schools. One government school told me they have good premises and resources (which they do), and they want to develop not only quality teaching, but English medium quality teaching. Their question? How do we do this? What a question! This is the crest of a wave that has been emerging over the last few years. There is no way the needs of teachers can be ignored. The Surkhet conference gave the teachers in mid- and far-West the awareness that they are part of a global happening, that there is a different way to work, which is not only fruitful but essential, and they quite understandably want to be part of this. This is a huge job, not a job for only a few enthusiastic volunteers, but a job that needs to be made systematic and imperative. The energy of the Surkhet conference cannot be allowed to lapse because of inability to follow-up. The task is how to work with hundreds of teachers who now want to know more, and want to know NOW! We have a collective responsibility as we have opened Pandora’s box. It is like showing a child a plate of sweets and telling them they cannot have them, they can only look. And this will escalate after the next conference, and the next. We do not need to think about will we be ready then – are we ready now?